Hi lovelies, how are you doing today? Autumnal weather inspires me to wear Gothic and smudge makeup look and I can't stop experimenting with black eyeliner, long lashes and black eyesahdows. Today I have prepared a very beautiful and dramatic Raven Wing Gothic eye makeup look and a very simple step by step tutorial, that will help you to recreate it. I hope for some of you this look will be somehow useful. 1. Let's start out Goth eye makeup with an eyeshadow primer, because we want it to last as long as possible. Apply the primer all over your lid, up to the brow bone and softly blend it with your ring finger. Give it some time to absorb into the skin and fill in your eyebrows. I have a very simple and detailed Instagram eyebrows makeup tutorial, that will help you to shape your eyebrows. 2. Apply pearly white eyeshadow on the inner corners of your eyes and on the brow bone. To make the blending process easier, I applied matte gray eyeshadow on the crease and blending the color with a soft blending brush. 3. For the eyelid I used a midnight blue eyeshadow with a fine shimmer and beautiful luster finish. Blend the transition between blue and gray eyeshadows with a soft blending brush. The same color I applied on the bottom lash line. 4. Now it is time to draw a black raven wing on our eyes. 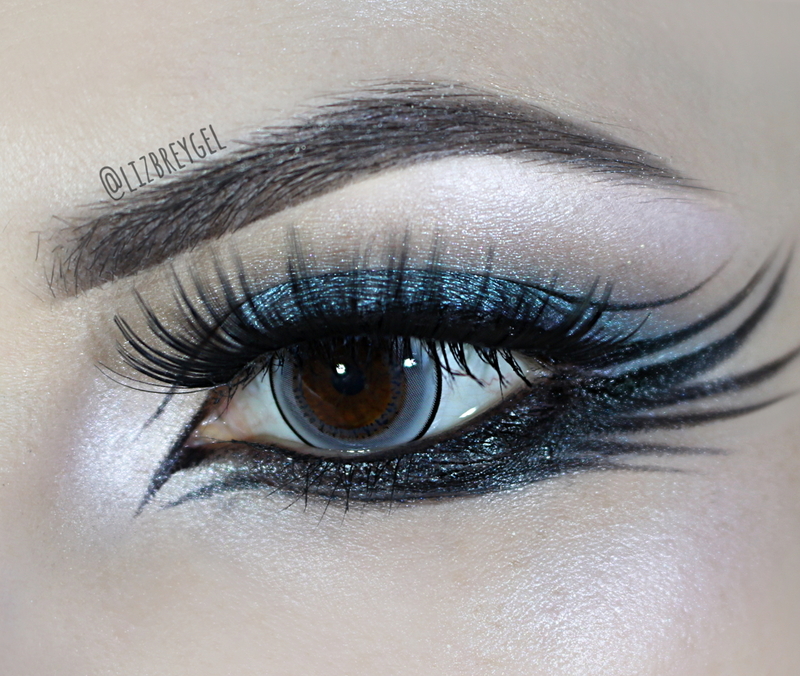 I used a black cream eyeliner and a fine angled eyeliner brush to create a dramatic Gothic wing on my upper lash line. I also added a thin line on the crease a drew few 'feathers' on the bottom lash line. 5. Clean up any fall outs and mess, curl your lashes and apply black mascara. To finish my Goth eye makeup I used a long false eyelashes. Voilà, the raven wing eye makeup is done! To make this look even more dramatic, I'm wearing Princess Pinky Eclipse Grey circle lens, you can check out my review on these lenses here. 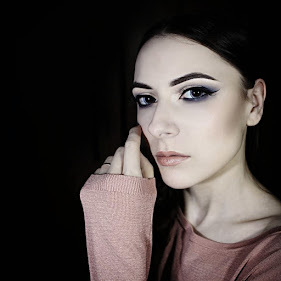 As for the lips, I guess the best way to complete this Goth makeup look is to use a very dark, burgundy lip color like 'Chocolate Merlot' by City Color (review is here) or simply add a black matte lipstick like Danimer (review is here). Please let me know your opinion on this makeup look, would you dare to wear it for a special occasion? I'll talk to you again very soon, hugs and kisses!